Can you see ways in which Marx’s views of the consumer society may help us to understand the art market? Use-value: the satisfaction of a particular human need. Exchange-value: what a commodity can be exchanged for. Because the value of labour is central to Marx’s thinking (and the exchange-value of a commodity is often greater than the cost of labour) Marx is critical of capitalisms emphasis on exchange-value over use-value. The concept of “usefulness” is steeped in ideology, and often demonstrate a conflict between mass produced/affordable goods and exclusive/expensive items. An example could be a factory made, mass produced loaf of bread versus a hand made artisan loaf. Essentially the goods have the same use-value in that they satisfy our hunger, however, the exchange-value is quite different with the artisan loaf costing much more even though the ingredients are essentially the same. Commodity fetishism is the idea that mass produced items are emptied of the meaning of their production and filled with new meanings which mystify the subject. A famous example of the power of commodity fetishism is given by Buchanan (referencing Adam Smith, ‘The Wealth of Nations’, 1776) – that a diamond can be deemed of greater value than fresh water despite the diamonds lack of obvious usefulness. That the diamond is so highly prized is unclear, an explanation could be rarity, however, this is not satisfactory since other similarly rare items are not as valuable. This analogy goes some way to explain (albeit simplistically) how a particular artwork is attributed value – someone (or more accurately a group of people) decides that a particular work is more valuable than the raw materials it is made from. During my reading two particular examples of how an artist themselves can become synonymous with value: Andy Warhol signing a dollar bill – the note was then worth hundreds of dollars rather than just one, Picasso towards the end of his life paying for meals by simply drawing on the table cloth rather than exchanging money. Does the article go any way to explain the sort of work made by artists such as Jeff Koons? If we accept that the exchange-value of a commodity is complex with many varying factors affecting it we can apply the same thinking to the art market and why certain works or certain artists are more highly prized than others. In ‘Playing to the Gallery’ artist Grayson Perry explores thoughts on the value of art. He asserts that validation is key and quotes Sir Alan Bowness (a former director of Tate) who believes that there are four stages to validation: peers, serious critics, collectors/dealers and (even) the public. Validators bestow upon artworks a layer of patina which builds over time into a reputation (and by suggestion increased exchange-value), this is important because few are confident enough to declare art as quality without first gauging the consensus. (He does note however that fortunes can rise and fall, quoting Francesco Bonami “Some artworks accumulate a patina and others dust.”) For Perry, collectors are key to an artist’s work gaining value. He uses the example of Charles Saatchi in the 1990s who could make an artists career simply by attending an exhibition. The lineage of artists like Jeff Koons can be drawn back to the origins of conceptual art and the work of Marcel Duchamp who posited that anything could be art. Later, pop artists and particularly And Warhol played with ideas of art and consumerism, however, crucially their work still looked like traditional art. The group of contemporary conceptual artists that came to prominence from the 1990s onwards and who Koons would be associated embrace the idea that artworks are consumer goods. They replicate the expensive finishes and highly crafted finishes of luxury items – Perry asks the question however, is this art or product? Find some example of Jeff Koons’ work and read up on Koons. If I have learned anything in this course so far it is that leading thinkers in cultural theory are predominately left leaning. It stands to reason then that many critics would have difficulty with Jeff Koons – his work is mind boggling expensive to make and sells for millions, he presents himself as always smiling, athletic, happy, successful and clean cut – as Jason Farago observes: “He is unfailingly polite, endlessly good-natured. In a cynical, ironic art world he comes across as a suburban-mall Father Christmas.” Most damming of all he went to work in Wall Street after graduating from art school. When the myth of the struggling artist sacrificing all to pursue his vision is so accepted, this is almost like committing an act of terrorism. 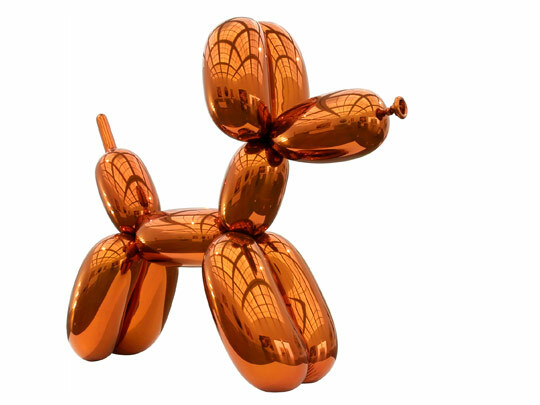 As Grayson Perry observes “art for art’s sake….does not pay the bills.” In 2013 ‘Balloon Dog (Orange)’ sold for $58.4 million making it the most expensive work to be sold at auction be a living artist. It seems many critics have issue with Koons’ superficiality, however they praise Duchamp for his elevation of the banal so what is the difference? Duchamp was clear about his intentions with his ready mades while Koons says his work has no hidden meaning. Do we take this at face value though? It seems to me that Warhol worked in a similar way, is his obvious lack of conformity with the establishment the only thing that separates him with Koons? Is it too much of a stretch to think that Koons is not being entirely genuine here? It is difficult for me to assess how I feel about Koons work, particularly the sculptures, it seems to me that they rely upon being seen in the flesh. (In my experience it is only possible to get a fleeting impression viewing artwork in a book or on the internet.) Before reading about Koons I was aware of his balloon sculptures from his ‘Celebration’ series because of how famous they are and I found them appealing on both a conceptual and aesthetic level. Producing huge shiny, sculptures of items steeped in the iconography of childhood seems playful and fun to me. Reading more has not changed my mind. I find it difficult to agree that Koons is all surface without anything else going on. A work like ‘Michael Jackson and Bubbles’ (1988) seems to me steeped in references to celebrity culture and I find the pose and facial expressions truly creepy and haunting, indeed prescient of the legal challenges that would follow, and Jacksons untimely death. Likewise the seeming perfectionism of Koons and great lengths he goes to have his works made is staggering. Various sources talk about how he nearly bankrupted himself trying to perfect fabrication techniques until he had the moment of understanding that he could ask his collectors to pay for work not yet produced. Understanding the market and that the price of his work is rising he knew that collectors would do this – the perfect manipulation of the capitalist art market. All Koons is doing here is recognising the realities of the commoditized art world rather than pretending that artistry and finance are two separate entities that should not meet. Before reading about Koons I expected his work to only consist of the balloon sculptures and was surprised at how diverse and wide ranging his work is. The elevation of common objects in the early work such as the vacuum cleaners in the ‘new’ series and the basket balls suspended in water of the ‘equilibrium’ series seems an interesting comment on consumerism, banality and how the every day can be elevated through being placed in a gallery setting. This contrasts strongly with the deliberately ostentatious later work like ‘Puppy’, a huge outdoor sculpture decorated with living plants and flowers that requires its own watering system. The question of why you would want to produce something so expensive and surely difficult to maintain – the only answer I can come up with is why not? Find a couple of examples of artists who work in a similar way to Koons. I have defined ‘work in a similar way to Koons’ as artists who work conceptually, use assistants, celebrate consumerism and whose works are sell for large amounts of money. Warhol needs a mention because his way of working and the myth he cultivated around himself seems a natural precursor to artists like Koons. He demonstrated it was possible to work in many different disciplines (painting, printing, photography, sculpture, performance, music, film) and that to be an artist you did not necessarily need to do any of the work yourself. The use of consumer and celebrity iconography in his work is of partucular relevance, howver, the bohemian set up of ‘the Factory’ is quite at odds with Koons modern and technologically driven way of producing work. A google search for ‘worlds richest artist’ most frequently brings up Hirst, and his celebrity as well as standing as artist rivals Warhol’s. Hirst uses sensationalism and shock unashamedly in his artwork, for example in his ‘Natural History’ series with its animals presented in glass cases suspended in formaldehyde. (When reading about Koons I was struck that his floating basketballs could have been an influence on Hirst.) For me an event in 1994 speaks volumes about Hirst as an artist – his work ‘Away From The Flock’ (a sheep in formaldehyde) was vandalised by artist Mark Bridger when he poured black ink into the tank and retitled the work ‘Black Sheep.’ Bridger was subsequently arrested and charged at Hirst’s wish and received a two year suspended sentence. It cost £1000 to restore the artwork. The story took a final twist when Bridger sued Hirst after a photograph of the work in his autobiography featured a black card which could be pulled down to obscure the sheep. Bridger alleged that by doing this Hirst infringed his copyright of ‘Black Sheep.’ The whole incident not only highlights that Hirst seemingly wishes to have his conceptual cake and eat it while demonstrating the problems of authorship in modern art. Murakami takes the idea of art as commodity to its logical conclusion. Since 2002 he has been associated with high end fashion house Louis Vuitton and has contributed artwork that has been used in their designs. He has then re-appropriated these in his own artworks and his 2007 retrospective at MoMA in Los Angeles featured a real, pop art Louis Vuitton shop. Murakami calls this his version of Duchamp’s ‘Fountain’, I am not so sure however. The first project that requires looking at actual art and artists! I can see the groundwork that is being laid to promote understanding of concepts and ways of thinking so I am beginning to appreciate why we have not been asked to look at artists and artwork directly up until this point. Approaching the assignment I felt that my understanding of ideas around art as commodity was quite robust so I would be able to complete in a shorter timescale than previous projects. However, I found myself becoming tied in knots, delving into more and more reading and research. It was all interesting but not all of it relevant. Because time is such a premium I need to try hard to resist this urge and focus on the key questions being asked. I need not to try and establish definitive answers to the questions posed but to be more succinct. As I progress with this course I am finding my understanding of subjects I have previously explored being enriched through further study and I need to accept that understanding is going to be a long haul rather than quickly gained. My initial written draft was much more extensive than what I have published here, I have tried to pair it down and concentrate on key points rather than (for example) provide a full explanation of Marxism or a complete retrospective of Koons’ work. I also stopped myself delving further into other artists only picking artists I had come across that seemed to share a similar ethos to Koons. Now to see if I can be more focused with the next project….! Commodification, capitalism, minimalism, conceptualism, the fetish of the commodity, consumerism, alienation. Karl Marx, Jeff Koons, Andy Warhol, Marcel Duchamp, Damian Hirst, Takashi Murakami, Grayson Perry. Williams, R. (2010) Keywords: A Vocabulary of Culture and Society. London: Fontana Press.